Make him feel safe: Your little one will feel he can move and discover what’s around him if he plays in a supportive and safe environment. You’ll also feel confident to encourage his independence if you know he can’t get hurt. Play yards are a great safe zone for him. These places will allow you to be near him and supervised him while giving him a chance to explore his toys and even practice crawling, sitting, pulling himself up, and cruise around. Swap toys around: Keep the toys you know he likes near; the ones that he knows how to manipulate and is familiar with. However, every now and then leave a new one to catch his attention. It doesn’t have to be a brand-new toy, you can always use old ones or even take some and hide them for a week or so and introduce them again. 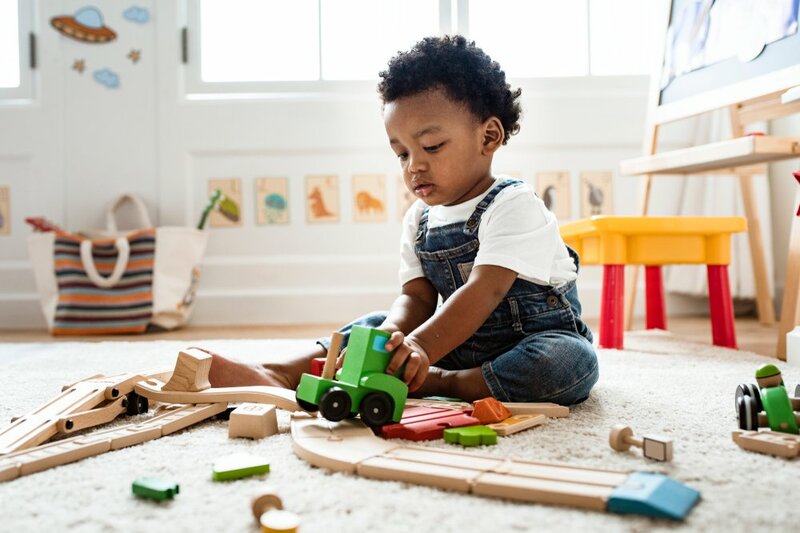 Explore with different types of toys: One of the ways your little one learns about his environment is through his senses. Try to involve different textures, smells, and sounds. Toys with buttons and wheels will also grab his attention. He’ll be so intrigued by those toys he’ll want to discover how they work. He’ll also love repetition as he figures out how things work, so you might see him filling the same box with objects over and over again. Follow his lead: Observe the things that he’s interested in and get those involved. He might be into noisy instruments, he might like constructive play with blocks, or he might be drawn to book illustrations. Everyone has different preferences so keep this in mind when encouraging him to entertain himself. Practice parallel play: In this type of play you’ll be playing side by side with your son without interacting or playing with him. Even though it might seem he’s doing his own thing, he is watching your moves and learning through them. The fact that you are setting the example while allowing him the space to figure it out on his own fosters his independence, decision making, and problem-solving skills. Limit screen time: We’ve previously talked about your little one’s exposure to screen time. When screen time becomes a habit, it provides so much sensory stimulation that a regular toy can have a hard time competing with that. Avoid having the TV on as background noise and instead have colorful toys your son can be drawn to play with. Trust that you don’t need to entertain your little one every minute of every day and try to encourage short yet meaningful periods of time where he can explore the world by himself. Your little one has a huge capacity for playing, learning, being creative, and inventive. Continue reading more about the science behind this at: Independent play: Encouraging exploration and creativity. And check out this article to keep fostering your little one’s creativity.